A plunge router is the perfect tool for creating beautiful picture frames or fluted cabinet doors that everyone will love. However, when you need to shop for a plunge router, there are numerous things to keep in mind. These are versatile power tools which plunge a bit into the surface of a material using precision and control, which makes them appropriate for all sorts of things that a fixed-base router simply cannot do. Versatility is a great option, but it can add confusion to the mix when choosing the right plunge router. That can make choosing the right power tool a bit of a stressful situation. That’s we wanted to offer a round-up of the top 10 plunge routers on the market and provides a bit of information about how to choose the right one for your needs. Makita RT0701CX7 1.25 HP Compact Router Kit 1.25 10,000 – 30,000 RPM 10 Pounds Check on Amazon! 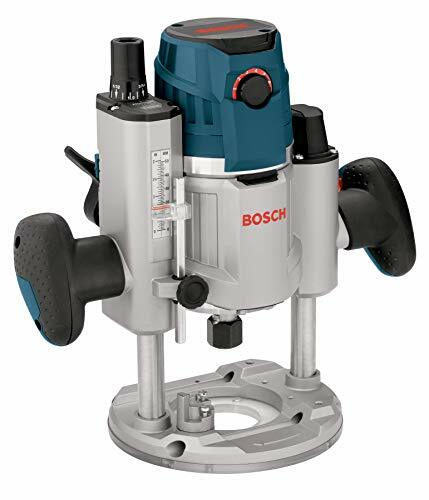 Bosch Router Power Tools 1617EVSPK Fixed Base Router Tool 2.25 8,000 – 25,000 RPM 18.2 Pounds Check on Amazon! DeWalt DWP611PK 1.25 HP Compact Router Combo Kit 1.25 16,000 – 27,000 RPM 8 Pounds Check on Amazon! Triton TRA001 3.25 HP Dual Mode Precision Plunge Router 3.25 8,000 – 20,000 RPM 13.2 Pounds Check on Amazon! 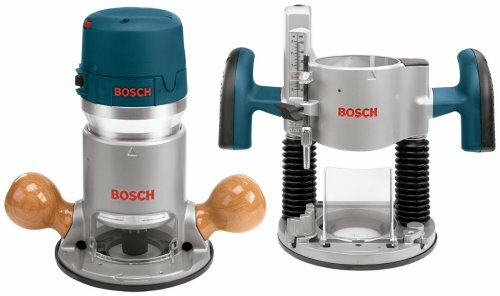 Bosch 120-Volt 2.3 HP Electronic Plunge Base Router MRP23EVS 2.3 10,000 – 25,000 RPM 12.6 Pounds Check on Amazon! DeWalt DW618PK 12-Amp 2.25 HP Plunge and Variable-Speed Router Kit 2.25 8,000 – 24,000 RPM 22.5 Pounds Check on Amazon! Masterworks 6.5 Amp 1.25 HP Compact Router Kit MW104K 1.25 10,000 – 32,000 RPM 11.95 Pounds Check on Amazon! 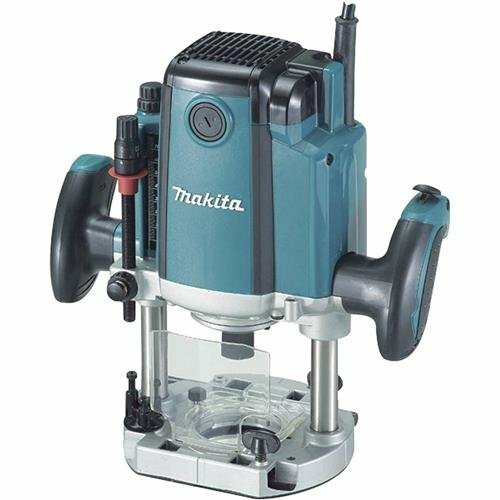 Makita RP1800 3-1/4 HP Plunge Router 3.25 22,000 RPM 13.4 Pounds Check on Amazon! 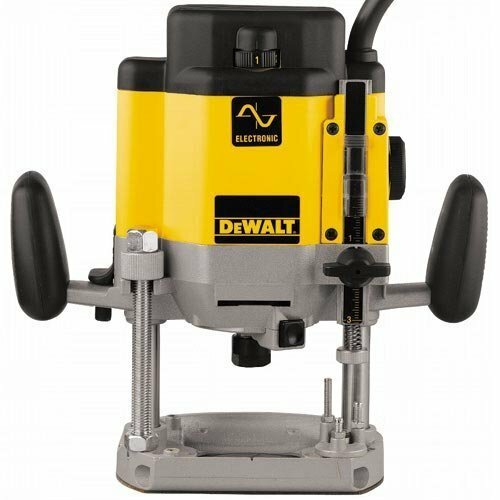 DeWalt DW625 3 HP Variable-Speed Electronic Plunge Router 3.00 8,000 – 22,000 RPM 11.2 Pounds Check on Amazon! 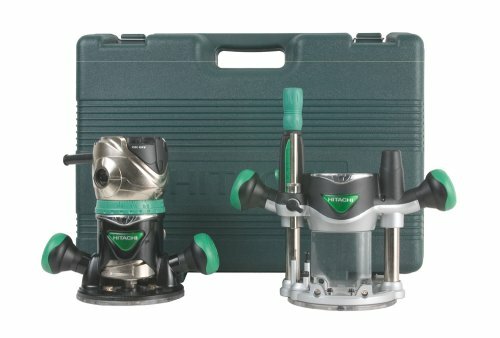 Hitachi KM12VC 2.25 Peak HP Variable Speed Fixed Plunge Base Router Kit 2.25 8,000 – 24,000 RPM 9.9 Pounds Check on Amazon! 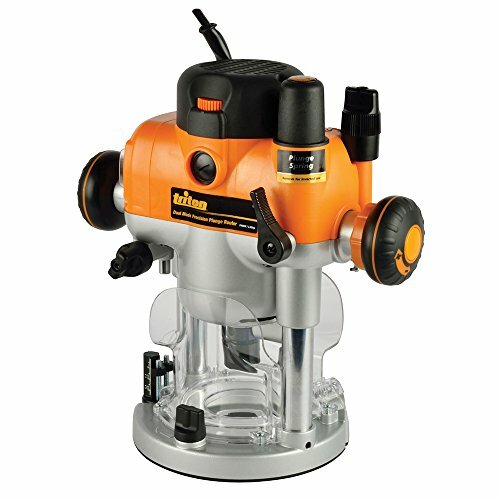 With this compact plunge router, you get a total of 1.25 horsepower and an RPM ranging from 10,000 to 30,000. This is more than enough power to handle any project you have, large or small. While using this router and learning to direct it can be overwhelming to start, with practice you can expect to do plenty of cutting, trimming, and creating designs with ultimate precision once you get used to it. The design of the RT0701CX7 is attractive and sleek with a teal top and silver and black accents. You can expect to always have a great line of sight when using the plunge router for better precision as you work. It has a lock system that includes quick-release tabs for less interruption while working. You can easily switch out bases and adjust depth in seconds to save time. This is a rugged power tool that has a motor housed in aluminum. You can expect stability when changing bits due to the flat top design. There are also depth scales and a power switch on the top at the front. The kit comes with the router, ¼” collet, plunge base, straight guide, and tow spanner wrenches. The Bosch 1617EVSPK has 2.25 horsepower and a 12-amp motor with all the extras you could want. One of the perks of this system is that you get both a fixed router and plunge router all in one. There are micro adjustments for depth and the router includes a soft start process so you can handle any job you want, big or small, with plenty of ease. This is a durable plunge router made out of aluminum, but it has a comfortable, soft-grip handle to make working with the tool all day long a breeze. The router is simple to use and you can expect a consistent speed for each cut you make, ensuring a clean result in the end. The router is lightweight and a speed of up to 25,000 RPM and at least 8,000 RPM so you get all the versatility you could want. This router comes with a carrying case for protection and includes a sealed power switch. This will ensure that no dust or debris is able to get inside while using the plunge router. There is also a quick clamp system for the base so setting it up and getting going takes only moments. There’s also an easy to use speed dial for top accuracy. The DeWalt DWP611PK offers both a fixed and plunge base for versatility when working. The kit includes the router with two bases, collet wrench, nylon storage base, and owner’s manual. The top of the router is made of a durable yellow ABS plastic. The power switch can be found on the lower part of the plastic housing. It has a rubber protector to keep it sealed from dust and debris. Just above the power switch, you’ll find the variable-speed dial that lets you adjust from 16,000 RPM all the way to 27,000 RPM. The motor is soft start and offers 1.25 horsepower and is designed with top and bottom air vents near the motor to keep it nice and cool. The body of the router itself is made of machined aluminum to offer a lightweight tool that is highly precise. The fixed base is removable and weighs very little. Depth adjustments are easy to handle and require no tools. Changing router bits is also simple due to the large button used to stabilize the router and the many motor shaft detents which stop the spinning on a dime. The plunge base is solid and has many different features to offer easy adjustments and improved performance. The TRA001 by Triton offers the chance to use the router as a plunge or fixed router so you have double the versatility over a traditional plunger router. There is an easy to use button switch that takes you from one type to the other and also provides a mode for rack and pinion. The automatic spindle lock of the system is easy to use and offers a single wrench option for changing out your bit whenever you like. Fine depth adjustments are possible with the micro winder in full plunge mode. In addition, the router offers variable speed options and a soft start so it can work with all sorts of different bits and will handle many types of material for your projects. There are air vents on the side to prevent dust from getting into the motor. This lightweight router has a speed of up to 20,000 RPM and a 15-amp motor. Coming from a well-known company that offers various precision tools, you know you’re getting a great plunge router. This Bosch MRP23EVS is a two-piece plunge router with a 15-amp motor and a sturdy base. There is an easy to use trigger on the right handle so making a cut is simple. The router offers control, safety, and stability while using it. The motor mount is made from a single piece of metal for durability. This tool features spring-lock plunge lever, smooth plunge action, and a depth rod for the most precise routing possible. It also includes a constantly on LED light, so you have great visibility near the bit. The precision centering design makes it easy to keep the bit on your cut line whether putting dovetail, jigs, or templates of all sorts. This plunge router has a variable speed dial so you can match the speed to your project and task. The constant-response circuitry helps you keep speed under load while offering protection from overloads. The package also offers swivel for extra mobility and contoured soft handles for comfort and control. Another great option is this all-in-one fixed base and plunge router. It features a variable speed motor so you can keep control no matter what you are working on. It comes with a ¼” and ½” collet along with a depth adjustment ring so you can handle all the adjustments you might need on the fly. There are vertical adjustments and adjustments at 1/64” increments for precision. The best part is that you aren’t required to use any extra tools to switch things up. There is also a dust collection process that gets rid of any debris without it ever touching the motor. It also allows you to see the bit at all times while working. This router locks down for stability and offers up to 24,000 RPM when it comes to speed. You also have micro-fine depth adjustment options. The handle on the router is comfortable and easy to hold for extended use. There is also a three-year limited warranty so you know the plunge router is one you can trust. This compact router kit from Masterworks comes with everything you need. It comes with the plunge router and base, five router bits, roller guide, edge guide, dust hood, two collets, carbon brushes, wrench, tool bag, and a great two-year warranty. The motor is 6.5-amps which is plenty of power for trimming and routing needs. The speed ranges from 10,000 to 32,000 RPM so you can work with all sorts of different materials. It can be used for all sorts of applications from edge forming to bit plunging, laminate trimming, slot cutting, dovetail cutting, and much more. The base and body are made of aluminum for durability over a long period of time. This plunge router has a smooth rack and pinion depth adjustment system. This offers precise operation no matter what sort of woodworking you are doing. The base is rubber-covered to protect your surface and the included dust hood helps keep the space clean. The Makita RP1800 offers a 15-amp motor that can offer up to 22,000 rotations per minute. It can plunge up to 2.75” which means you can work with all sorts of different projects and handle any of your needed detail work. It includes linear ball bearings for smoothness and a quick release for micro control to get the most precise cuts. This plunge router has three preset depth stops so you can easily determine when you hit the depth you want. There are also ergonomic handles coated in rubber to prevent vibrations. There is an easy to operate two-finger switch along with a lock lever in a convenient spot for the most efficient operation possible. You don’t need any extra tools when you’re in a situation where you should adjust the depth of guides, which makes the process simple. There is a built-in fan and a construction that helps prevent dust from getting into the motor. The chip deflector prevents anything from flying up and hitting you during use. The DeWalt DW625 has the most powerful motor on the list at three horsepower. It has a large range of speeds that go from 8,000 to 22,000 RPM. It offers easy of use for plunges and rips courtesy of soft start technology. The base has a straight edge along with functions for dust collection. The depth adjuster is rack and pinion which makes it easy to manipulate. It also features magnified measurement guides for convenience and ease of use. The depth adjustment is micro-fine so you can make the most accurate and quick adjustments whenever you need to do so. This plunge router comes with a ¼” collet, ½” collet, template guide, dust extraction adapter, bushing adapter, and a wrench. The handle is soft and comfortable and the router itself is lightweight for easy use and transport. It also has a three-year limited warranty for the best peace of mind. This Hitachi KM12VC is a fixed router that doubles as a plunge router to handle any project you need. It has an 11-amp motor offering great precision and control. This ensures you get the best quality out of every project. There is a two-stage release clamp so you can easily swap out the base and make depth adjustments. There is an electronic speed control with the router, so you get a consistent level of RPM while using the router. It has very little noise and won’t cause your workshop to get too loud. This means you can work any time of the day that you want without disturbing the other people who are around you. The RPMs on the KM12VC go up to 24,000 using the variable speed adjustment and there is limited vibration which makes the router comfortable to use for extended periods of use. The ergonomic handles add to the comfort and the kit comes with everything you need to get started right away. When you purchase a plunge router, you get the ability to create slotted keyholes and inlaid designs or use grooving, fluting, doweling, and mortising to create a beautiful project. These tools offer versatility and value to a professional’s work but can also be useful for a home user. Below we’ll offer insight into the things to consider when choosing a plunge router. A mid-sized router is typically going to offer the best performance in terms of value. This usually means a machine with somewhere between 1.75 and 2.25 horsepower. However, those who are going to be working in a professional environment may want to go for something a bit more powerful. Either of these options will let you handle dovetailing, large profiling cuts, and mortising. While you might think getting a large router is the best option, that isn’t always the case. A compact router can be used as a handheld tool as well as being used on a table. Those who plan to get a lot of use out of their router may prefer a router that is larger with a bigger motor, but this can be more of an investment. Variable Speed – This is an important feature because you can have different speeds depending on the project you are working on. For instance, small bits work well at high speeds while large bits may need a slower speed. Electronic Feedback Circuitry – This features helps measure your load to balance output torque. That means that your motor won’t stall out even during a heavy cut. This is a feature that can be really useful, but you don’t know you need until you try it. Soft-Start – With soft start, your tool will slowly turn on rather than coming on at top power. There’s a small pause when turning it on before it slowly moves to the speed you want. It’s a nice features that most routers offer nowadays. When you consider all of these features and options, you can see why choosing the right plunge router can take some time and effort. Any of the options we’ve mentioned will make a great choice for your home or professional workshop. Think about what the router will be used for and go from there. Take time to consider what you need and you’ll soon be able to appreciate having your own fancy new plunge router.